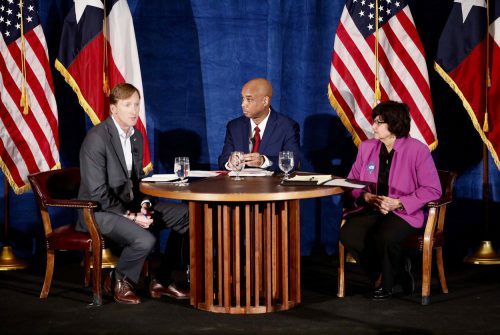 Meeting at a church in Austin, Andrew White and Lupe Valdez sounded out their differences — sometimes with rancor — over the two issues that have provided the most tension in the race so far, including White’s personal opposition to abortion. They also sparred more broadly over their Democratic credentials, with White emphasizing the need for a moderate to go up against Republican Gov. Greg Abbott in November and Valdez suggesting disagreement with that approach. The issue of abortion led to perhaps the most dramatic moment of the night. White personally opposes the practice, but has said he respects a woman’s right to choose and would veto any legislation that infringes on that right as governor. Addressing the issue at the debate, White sought to align himself with longtime president of Planned Parenthood, Cecile Richards, who has discussed the difference between Democrats who are just personally against abortion and elected officials who impose those beliefs on others. That was not good enough for Valdez, who insisted that White’s position implies he believes woman who decide to have abortions do not respect life. White, who has said he and his wife “have made the decision that we respect life,” denied repeatedly that he was casting judgment on women who choose abortions before Valdez interjected. “Andrew, you owe an apology to these women,” Valdez said. White, after taking a dig at the “theatrical” nature of her answer, held firm that his personal beliefs on the issue would not influence how he would govern. “My personal opinions are my personal opinions, and as governor, I would trust women to make their own health care decisions,” White said. The two also clashed over immigration, namely Valdez’s record of interactions with federal authorities in Dallas County. After Valdez insisted she is the “only one that’s running for governor that has fought … against anti-immigration laws for years,” White noted she did not go as far in resisting cooperation with ICE as Travis County Sheriff Sally Hernandez did. White also played some defense on border issues, fielding a moderator question about a company he owns that uses heartbeat-detection technology to find people hiding in vehicles. While the company has been criticized for profiting off illegal immigration, White insisted the technology saves lives and is a better approach to border security than what Republicans have been proposing. Still, he confirmed he is “actively engaged” in the process of divesting from the company, which has drawn fire in the race in recent weeks. Questions about how to win in November also permeated the debate. White has been emphatic that it will take a “moderate” to triumph in November, pointing to recent special election victories across the country by Democrats who are not ideologues. “In this Donald Trump world that we live in, things have changed,” White said, suggesting he could appeal to moderate Republicans like followers of state House Speaker Joe Straus. “I support very much the LGBT community — I understand their issues, I’m passionate about those issues and I’m willing to fight for those issues,” said White, who went on to acknowledge his church’s position but insisted it is hard to find a church “where everybody’s on the exact same page” and emphasized his support for the separation of church and state. Responding to the question about her editorial board snubs, Valdez began by sarcastically congratulating White. Then she argued she has the “endorsement of the people,” pointing to supporters like the Texas AFL-CIO and Planned Parenthood. As for the editorial boards, she suggested there was an issue with communication. White’s campaign was confident after the debate, issuing a statement predicting more progressives would switch their vote to him in the runoff. “We look forward to debating Gov. Abbott in the fall,” read the statement from White’s campaign manager, Jenn Char. In a separate huddle with reporters, Valdez fielded questions mostly about White’s position on abortion, which she said was welcome in the Democratic Party but not above scrutiny from other members. As governor, she suggested, she would be more proactive than him in working to protect abortion rights. This entry was posted in KRTS News, KXWT News and tagged TX Decides, tx2018. Bookmark the permalink.